Slow Cooker Quinoa Brownies. You guys!!! 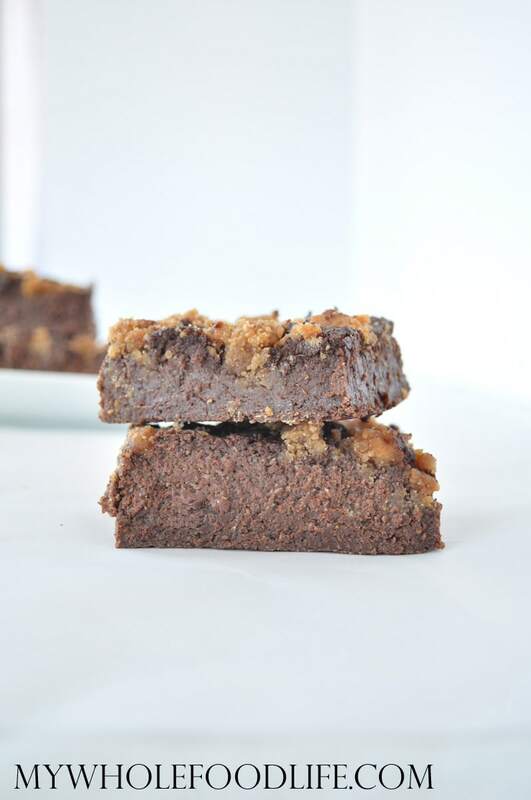 You have to try these slow cooker vegan quinoa brownies! Just when you thought quinoa brownies could not get any better. This recipe is seriously easy and it can cook while you are not even home. I added peanut butter to these slow cooker gluten free quinoa brownies, but you can really use any nut butter you like. Who doesn’t like chocolate and peanut butter together, right? If you need a nut free version, I think sunflower butter will go very well. I wanted to take the peanut butter chocolate flavors to the next level, so I swirled some peanut butter on top of these as well. Not only are these slow cooker quinoa brownies easy to make, but they also come with a boost of healthy protein. This recipe freezes well also. Cook these delicious brownies while you are not even home! Combine all the brownie ingredients in a blender and blend until smooth. Line your slow cooker with parchment paper. Make sure you have a little going up the sides as well. Pour the batter into the parchment lined slow cooker . To make the peanut butter swirl topping, melt the peanut butter and almond milk in a small sauce pan on medium heat. Just mix until you have a loose enough consistency to swirl on top. Swirl the peanut butter mixture on top. I used a thin spatula . I cooked the brownies on low for about 2 hours and they turned out great. The cooking time may vary depending on your slow cooker. I could tell it was done when I felt the top spring back a little. Once the brownies are done, lift them out by the edges of the parchment paper. I used a pizza cutter to slice mine into small bars. Store in the fridge. They should last at least a week. You can also freeze them for longer. Enjoy! These sound absolutely delicious! Just one question, what size slow cooker? Thanks, I want to make these as soon as I can!! Thank you!! I used a 6 qt, but any size will do. You may have to adjust the cooking time based on the size of yours. Mine is an oval shaped slow cooker. In the slow cooker!? That is awesome! Yes. I think in an 8x8 pan they could be baked. Bake at 350 for 30-40 minutes. What would you sub for the maple syrup, if, say, you were out and REALLY wanted to make these? Can you use honey or coconut sugar? Is the nut butter a must? These sound delish. What can replace the coconut oil? So many healthier recipes use this and I cannot stand the smell! I have an allergy to quinoa, so would you recommend another grain? Bought a bunch of amaranth...and looking for ways to use it...what do you think? Any hints? This is all sorts of awesome! Have you tried a blondie version? Thanks! Not yet, but that is a great idea!! Thanks for sharing. Can't wait to try this. What's your take on using pb2 instead of regular peanut butter? Personally I prefer peanut butter in it's original form vs a powder. Thank you Melissa. These are so yummy! Is the coconut oil liquid or solid? Cooking desserts when you aren't even home? Win! Do you use a vegan chocolate? Do you have a brand you recommend? I have been having chocolate cravings lately and that's my downfall! Thank you! They will work in the oven as well. Maybe bake for 30-40 minutes? Made these tonight following the recipe to a 't' using real eggs, they are phenomenal! My kids are loving them. Thanks for the great recipe! We are in the midst of a heat wave, so anything that doesn't require me turning on the oven is GREAT! One question: I have a giant slow cooker. Any thoughts on success if I double the recipe? I haven't tried doubling it. It may work, but I am not 100% sure. If you try, please let me know how it turns out.